Acne is still not very well understood. It seems to start with an overproduction of sebum and is then made worse when bacteria invade the glands and cause inflammation resulting in the unsightly red spots we have all seen/had/are currently suffering from. Acne is a miserable condition to suffer from. It is usually treated by applying an antibacterial to the skin. The best known brand is Clearasil which simply uses a well known antiseptic called cetrimide. This works well enough on mild acne, and can be shown to work. For more serious acne there are brands like Brevoxyl. These contain benzoyl peroxide which both kills of the bacteria and seems to break down the sebum to some extent clearing up the acne a bit quicker. Once again, benzoyl peroxide works well and can be shown to work in a clinical trial. But I am sure that every acne sufferer would agree that prevention is better than cure and a product that offers to prevent the spots forming in the first place sounds too good to be true. So what do we make of Praventin? The claimed mode of action is that drinking it inhibits the growth of bacteria. Well that is one hell of a claim! I am a bit above average in size for a human being, weighing in at about 80Kg. The idea that I can drink enough of an antibacterial agent to have an effective dose level across the whole of my skin sounds very far fetched. The stuff would have to be very potent to be able to work at such low levels. And if it is so powerful, I am not at all sure I want to drink it. Was I impressed? No I wasn’t. For a start the study is not published in a peer reviewed journal. Nobody independent has looked at this data. But even worse, there is no control. The placebo effect is a very powerful one. Tell a group of people that they are getting a special treatment for their skin, and then take a great deal of interest in them and ask them lots of questions about it, and it is quite likely that they will show an improvement in their skin condition. It is for this reason that all proper clinical trials are done using a placebo. Without the information on what a simlar group of people NOT treated with Praventin would have behaved, there is simplly no way the study means anything at all. I suppose I should conclude by saying that in the absence of a placebo controlled trial we can’t be absolutely sure that Praventin doesn’t work. So I will draw one definite conclusion. If you buy this product you will definitely have less money afterwards, and the people from whom you buy it will have more. 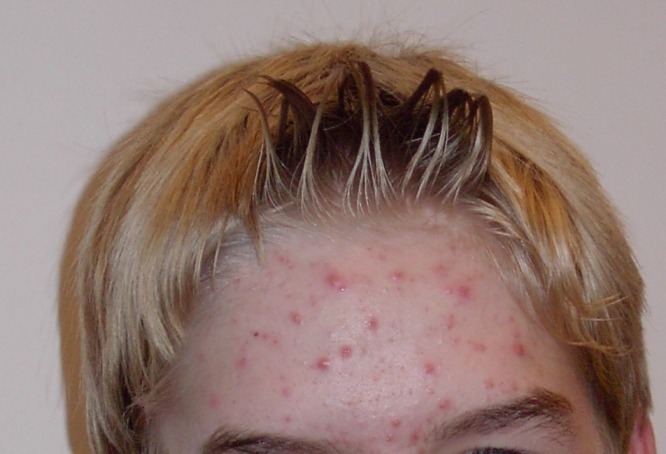 Thanks to the acne page on Wikipedia for the image. Wikipedia gets a lot of criticism, but the article on acne is excellent – or at least it was the day I read it. I have worked a lot in acne and know that it is a very difficult condition to treat. 7.9.08 My thinking on acne has changed a bit since I wrote this article. Have a look here for some information about how diet affects acne. Thanks for taking the time to comment Ash. This isn’t one of my particularly popular articles but nonetheless has managed to attract 3,000 viewers so far. It would be really interesting to hear other people’s experiences as well. Acne causes so much misery I would love to be proved wrong and to be able to recommend a cure for it, but I think we need a bit more than one successful case. The January 2011 issue of Allure says there is a new placebo controlled study that supports praventin’s results for decreasing acne and oiliness when combined with a yogurt drink. If you guys get your hands on a copy, it’s pg. 46. Interesting results, makes me think I might try it for a couple months since it’s so much cheaper than what I currently use!